Out of all the payment services in the market, Apple Pay Cash is reported to be the highest rated peer-to-peer payment service on the market. The review was conducted by Consumer Reports citing that Apple Pay Cash leads the way in P2P payment services. 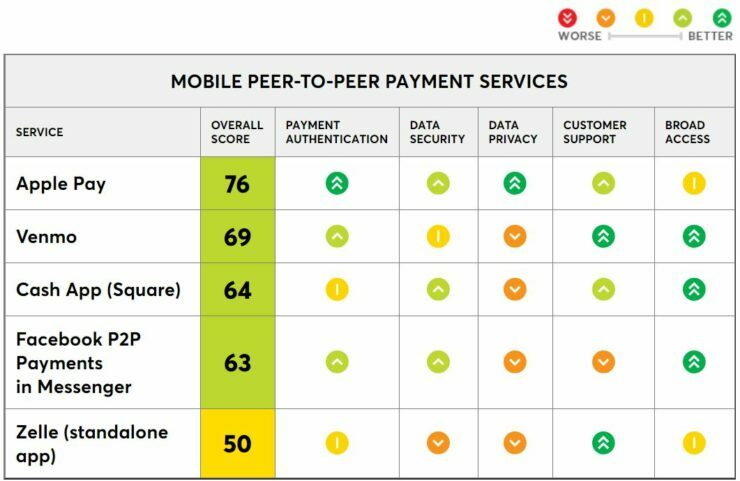 The comparison is the first of its kind in which Consumer Reports analyzed the pros and cons of various P2P payments. So let’s dive in to see some more details on the matter. In the comparison, Consumer Reports analyzed the upside and downsides of Apple Pay Cash, Square Cash, Zella, Venmo and Facebook Messenger P2P payments. However, one thing to note here is that Google Pay’s new money sending feature was not part of the test. The payment systems were judged on the bases of authentication, privacy, security, customer support and broad access. Broad access in this regard refers to the service not being limited to a specific bank or a specific device. While all of the mentioned P2P payments services were rated good enough to use, Apple Pay Cash generated the highest score. The main reasons for Apple Pay Cash’s high results were the data security and strong privacy measure. Apple Pay was the only service that got top marks from CR for data privacy, because its policies state that it limits the information it collects and shares on users and their transactions. It doesn’t store credit card or debit card numbers, and it states in the terms and conditions that it doesn’t sell users’ personal information to third parties, CR found. The only major drawback that Apple Pay Cash had to face was the use if new Apple hardware which came under the “broad access” category that we mentioned earlier. Zella was the least favorite in the comparison due to its poor data policies and its failure to confirm payments in the mobile application. However, the company did say that the feature will be added in late October of this year. Check out the table for more details. There will be more details on the matter, so be sure to stay tuned in for more details. This is all for now, folks. What are your thoughts on the ratings? Do you think that Apple Pay Cash deserves the first spot? Let us know in the comments.